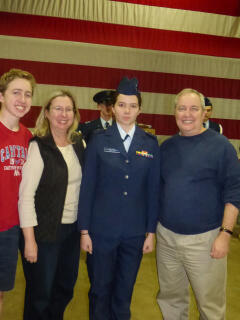 Cadet Rachel Shelton Appointed to USAFA! It is difficult for most people to get accepted into the Coast Guard Academy, West Point, or the Air Force Academy (USAFA). However, Cadet 2nd Lt. Rachel Shelton is not most people. As an active Cadet officer at the Raleigh Wake Composite Squadron of the Civil Air Patrol, she was accepted into all three military academies as well as AFROTC at NC State, UNC, and Duke University. We are very proud of this amazing cadet! Cadet 2nd Lieutenant Rachel Shelton, is an outstanding, motivated cadet. She joined just short of two years ago with the goal of achieving her Mitchell award before the summer of her senior year. She has been highly involved in CAP; attending Ranger events, participating in O-Flights, attended NC Wing Encampment, and now serves as a Flight Commander leading the Great Start Program for new Raleigh Wake Cadets. In her “spare time” she is engaged in academics, speech and debate, and athletics. C/2d Lt. Rachel Shelton is a model cadet, who will stop at nothing and keep going until she reaches her goals. She is continually striving to improve herself and the cadet program and has left a positive mark on the Raleigh Wake Composite Squadron. She will take everything she learned in CAP from leadership, to followership, to drill and ceremonies, and customs and courtesies and become an even more outstanding cadet at the USAFA. It is safe to say she will succeed at the Air Force Academy partly thanks to what she has learned through CAP. While we are quite proud of her, her parting will be bittersweet. We will miss her greatly, but look forward to the great things she is set to accomplish in this world. Aim High, Cadet!